Pressure Technology, Inc. (PTI), a leading provider of hot isostatic pressing services, announced that the company has recently completed a major expansion of their processing facility located in Warminster, PA. In addition to providing an increase in general production space, the expansion also included the installation of a new hot isostatic press, bringing the company’s total to eleven units. Designed to accommodate the growth of its services, the building expansion and additional processing capability will position the company to meet both current and future sales goals. "The expansion is in direct response to our growing customer base in the Northeast and Mid-Atlantic regions," said David Bowles, General Manager of PTI. "Demand in both areas has been steadily increasing for the processing of parts for aerospace, industrial gas turbine and medical applications. In addition, the use of additive manufacturing techniques is starting to take hold which will further increase the demand for our hot isostatic pressing services," he added. The expansion has added 7,000 sq. ft. of production floor space for staging incoming customer products prior to processing and the new HIP unit, bringing the total to over 15,000 sq. ft. for the entire facility. The building expansion and additional unit will benefit PTI’s customers by providing better lead times and additional HIP capacity. Adding to the facilities overall processing capabilities, the new unit has an overall working length of 108" and a diameter of 30". The new unit can achieve a maximum temperature of 2,450° F and a maximum pressure of 25,000 PSI and is designed to accommodate parts for the aerospace, biomedical, industrial, power generation and other industries. Pressure Technology, Inc. (PTI), a leading provider of hot isostatic pressing services, announced that the company has recently completed a major expansion of their processing facility located in Concord Township, Ohio. An integral part of the expansion was the installation of an additional hot isostatic press, bringing the company's total to ten units. Designed to accommodate the growth of its services, the building expansion and additional processing capability will position the company to meet current and future sales growth. "The expansion is mainly in direct response to our expanding customer base in the Mid-West region," said David Bowles, General Manager of PTI. "The region is also home to major research facilities and production plants that are developing additive manufacturing processes which will continue to increase the demand for our hot isostatic pressing services", he added. The expansion has added 7,000 sq. ft. of production floor space for staging incoming customer products prior to processing and the new HIP unit, bringing the total to over 23,000 sq. ft. for the entire facility. The building expansion and additional unit will benefit PTI’s customers by providing better lead times and additional HIP capacity. Adding to the facilities overall processing capabilities, the new unit has an overall working length of 108" and a diameter of 30". The new unit matches the capabilities of an existing unit, also located at the Ohio facility. The new unit can achieve a maximum temperature of 2,450° F and a maximum pressure of 25,000 PSI and is designed to accommodate parts for the aerospace, biomedical, industrial, power generation and other industries. PTI Adds Its Largest HIP Unit to Date with a Working Length of 108"
Pressure Technology, Inc. (PTI), a provider of hot isostatic pressing services, announced that the company has installed its largest HIP unit to date in their facility in Concord Township, Ohio. "The new unit features an overall working length of 108" and a diameter of 30"," said Richard Walker, Plant Manager of PTI Ohio. "This gives us the capability to process larger parts as well as an increased number of smaller parts per run. In addition, the capacity afforded by this new unit will help fulfill the increased demand for our services and enhance our ability to meet our customer's turnaround needs." The new unit can achieve a maximum temperature of 2450° F and a maximum pressure of 25,000 PSI and is designed to accommodate parts for the aerospace, biomedical, industrial and power generation industries. Pressure Technology, Inc. (PTI), a provider of hot isostatic pressing services, announced that the company has increased HIPping capacity by adding an eighth HIP unit to their facility in Concord Township, Ohio. "The installation of the hot isostatic pressing unit was completed during April 2009 and is now ready for customer production runs," said Richard Walker, Plant Manager of PTI Ohio. "Our high level of service, responsiveness and competitive pricing has led to significantly increased market demand for our hot isostatic pressing services in the Midwest market. The additional capacity afforded by this new unit will help fulfill the increased demand and enhance our ability to meet our customer's turnaround needs." The new unit can achieve a maximum temperature of 2450° F and a maximum pressure of 25,000 PSI. The eigth unit is identical to three other Ohio units with a 30" working diameter designed to accommodate parts for the land based turbine and aerospace industries. Pressure Technology, Inc. (PTI), a provider of hot isostatic pressing services, announced today that the company has increased HIPping capacity by adding an seventh HIP unit to their 12,000 square foot facility in Concord Township, Ohio. "The installation of the hot isostatic pressing unit was completed during the fourth quarter of 2007 and is now fully operational," said Richard Walker, Plant Manager of PTI Ohio. "We're responding to the consistent increasing demand in this marketplace." The new unit can achieve a maximum temperature of 2450° F and a maximum pressure of 25,000 PSI. The unit is identical to two other Ohio units with a 30" working diameter designed to accommodate parts for the land based turbine and aerospace industries. PTI plans to continue expansion to meet market demand for hot isostatic pressing services by adding an eigth HIP unit during the second quarter of 2009. Pressure Technology, Inc. (PTI) the Warminster, PA-based hot isostatic pressing company, has added two new hot isostatic pressing units to increase capacity at the company's 12,000 sq. ft. HIP facility in Concord Township, OH. The two newest units now give Pressure Technology six total hot isostatic pressing units, three of which are housed in the Ohio facility. "The continued expansion of HIP capabilities at our Ohio facility allows us to meet the demand for service in the Midwest and also allows Pressure Technology to better serve our clients in that region," said Richard Walker, Plant Manager of PTI. The two new units are both large diameter chambers, accommodating larger parts such as turbines, powder billets and structural parts used in the aerospace industry. Both new HIPping units can achieve a maximum temperature of 2450° F and a maximum pressure of 25,000 PSI. 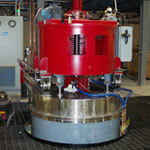 Pressure Technology, Inc. the Warminster, PA-based Hot Isostatic Pressing Company, has opened a 12,000 sq. ft. HIP facility in Concord Township, OH, a location approximately 20 minutes east of Cleveland. The new plant houses a 16" diameter unit with plans for future expansion. David Bowles, PTI's General Manager, in announcing the opening of the Ohio operation, stated that "this new facility will better serve our present Ohio area customer base with lower shipping costs and faster turnaround. In addition, it will also enable us to open new markets in other nearby states." Addition of the new HIP unit, which was designed and built by PTI, also increases the company's processing capabilities and paves the way for expansion into new market areas. With a chamber diameter of 30" and 70" length, the unit is now the largest unit on PTI's production floor. The large size means that PTI can accommodate larger parts, such as land-based turbine blades, powder billets and structural parts for aerospace. The unit can also process a larger quantity of materials in a single cycle, thereby permitting more cost-effective processing. In addition to its large size, the unit also has a high pressure capability of 25,000 psi (170 MPa) and a temperature operating range up to 2450° F (1340°C). The high pressure capability, combined with the larger size, presents new opportunities for design engineers and also enables PTI to expand services for casting densification, diffusion bonding, HIP brazing, and powder consolidation.